On this trip, I was joined by Patricia Johnson (my wife) who was making her first visit to our search area in over two years. Phil Vanbergen was along on Friday, when a classmate of his, Jeremy Irion, spent also spent the day with us. Steve Pagans, retired forester at D’Arbonne National Wildlife Refuge, was very active in our efforts until he was sidelined with back trouble. He too made his first visit in over two years on Tuesday and Wednesday. It’s great to have Steve along for his birding skills and knowledge of this habitat type. Phil returned on Tuesday and Wednesday, and spent Thursday in the woods on his own. Frank Wiley was unable to get out this time around. Prior to our departure, rain was predicted for three of our planned field days, but as it turned out, the weather was generally tolerable, if cold at times; Saturday was the only day when conditions, high winds and predicted thunderstorms, kept us away. Patricia and I took that day as an opportunity to visit Tensas National Wildlife Refuge (on the site of the Singer Tract) and Bayou Cocodrie National Wildlife Refuge. More on these visits below. Although I didn’t have any possible encounters (Steve and Patricia’s will be discussed in Part 2), the trip was an incredibly productive one for me. We found a good deal of recent feeding sign. I also took the opportunity to look at over 10 hickories that have been scaled within the last several years. This is the type of work I think is most compelling for ivorybill. I got what I think are some important new insights and some ideas about how whatever is stripping bark is behaving over time; these merit a separate post that will likely follow Part 2 of the trip report; I also anticipate writing an addendum to the feeding sign page I added recently. I hope these insights can inform our strategies going forward. It’s especially helpful to get fresh perspectives, so I’m grateful to Phil, Steve, and Patricia. Each in their own way helped me think a little more deeply about my observations; a conversation I had with Frank after a long day in the field was similarly helpful. The groups of images in this post are in “tiled mosaic” format. Clicking on any single image will enable you to scroll through the group and enlarge the individual photographs if you choose to. We met Phil on the edge of what we call Sector 1 at 6:45 am on the 16th. The weather was cloudy, cold, and windy; later in the day, the thermometer soared to nearly seventy, but the skies remained a wintry gray, less than ideal conditions for finding feeding sign or observing birds. Nevertheless we did find some recent work on both standing and downed sweetgums and on a broken hickory limb, all of this in an area where we’ve found an abundance of scaling every search season. None of this work is in the category I find most compelling; the hickory limb is probably most interesting due to the characteristics of hickory bark and the very large bark chip we found below the limb. Given what we’ve observed on hickory boles, this may be good target tree for later in the season. The scaling on the downed limb has some features that might point toward Pileated, especially the layered appearance at the lower right and the patchiness of the work on the smaller limb. Conversely, the shredding of the cambium on the stub is consistent with what Edith Kuhn Whitehead told us her father associated with ivorybills. Phil and I considered aiming a trail cam at the downed limbs but decided the work was not quite interesting enough. Extensive, recent scaling on a hickory limb. The weather forecast for the 17th was ominous, with winds upwards of 20 mph and thunderstorms predicted for the afternoon. Patricia and I thought we might be able to spend a couple of hours in Sector 1, but when we reached the trailhead we found a truck parked where we were planning to walk in. Given the bad weather and the presence of hunters, we decided to head straight for Tensas, a pilgrimage I’d been wanting to make for some time. The drive took a couple of hours, and our Wayz app sent us on a couple of roads that dead-ended in bean fields, but we finally made it, only to find the visitor center closed for the weekend. We took a walk on the boardwalk behind the headquarters and found a dead tree that had been almost completely stripped of bark, large soft slabs of which were lying around the base. I’m posting a photograph to illustrate how difficult it can be to explain what we’re finding to those who haven’t seen it firsthand. I doubt there are ivorybills in Tensas, but if I found this work in our area, I wouldn’t suspect ivorybill. The remaining adhering bark is loose and decaying; the large slabs we found on the ground were soft and pliable. The tree in the background has a little bit of scaling on it too, but it is in an advanced state of decay, and the bark has not been removed from large, contiguous areas. As we drove around Tensas, we did note occasional instances of high branch scaling, but nothing remotely suggestive. Again I’m again including these examples in hopes of providing more clarity with regard to the kinds of feeding sign I find suggestive for ivorybill; this work doesn’t qualify; it is on very small, longer dead limbs; it does not involve large, contiguous areas; nor does it reach the bole or larger parts of the limbs. Patchy high branch scaling, Tensas NWR 2013. We spent a couple of hours exploring the refuge from the road, stopping at Africa Lake, on the West side of the Tensas River, and then drove Sharkey Road, stopping for a somber moment on the bridge over John’s Bayou. I’m facing south in the picture below; Tanner would have walked north to the core of the home range. There are strips of maturing woods along the banks of the bayou but bean fields to the east and west. Tensas is big, extensively wooded, and an impressive restoration effort is under way, but the visit left me saddened, with a more visceral sense of what was lost when the Singer Tract was logged. From Tensas, we went to Bayou Cocodrie, a nearly 15,000 acre refuge that’s part of a large, east-central Louisiana potential habitat complex. While the corridors are not uninterrupted, they encompass many thousands of acres of maturing forest, from D’Arbonne and Tensas National Wildlife Refuges to Raccourci Island and Tunica Hills. There’s some connectivity with the Atchafalaya Basin as well. Bayou Cocodrie is fairly isolated and hard to reach (Wayz was unhelpful again); it includes a small (775 acre) stand of old growth hardwoods (the Fisher Tract), and there may be a good deal more surrounding forest that’s suitable for ivorybills. I met a professional hunting guide a couple of years ago, and he claimed to have had an encounter there. We’re planning to visit Bayou Cocodrie and see the Fisher Tract and surrounding areas on my next visit. Patricia and I were on our own on the 18th, which was a much colder, clearer day after some early morning clouds broke up. We spent the early part of the day in the northeastern part of Sector 1 and didn’t find anything of interest. We went to the scaling concentration in Sector 3 in the latter part of the morning and stayed in the area until about 3 pm. I didn’t notice any new scaling worth mentioning, but we found a limb that had fallen and broken apart in the storms that had raged through the night before. The scaling had been done before the branch fell, and except for one targeted dig, there was no associated excavation. While some of the bark had loosened, it was tight (impossible to remove without an implement) on the edges. I’ve included several images because they help illustrate the difference between the very extensive scaling we’re finding in our area and what’s common elsewhere (as shown in some of the Tensas photos). Patricia is 5’9″. Patricia with broken pieces of shattered limb. Scaling took place before the limb fell. Bark was tight except for the dark patch on the piece at second from left where bark was removed by hand. The only excavation on fallen limb. I’ve just finished reading Tanner’s dissertation and have gained some new insights into topics that have been discussed in a number of earlier posts. Conventional wisdom, following Tanner, holds that the Ivory-billed Woodpecker’s decline and possible extinction were caused by habitat loss, specifically the logging of old growth forests during the 19th and early 20th centuries. Birdlife International’s fact sheet on the species suggests “that large contiguous tracts of mature woodland would be required to support a viable population”, referencing Jackson 2002. Snyder et al. have proposed an alternative hypothesis that “human depredation was the primary factor.” (p.9). Tanner’s model depends on the idea that food supply was the limiting factor on ivorybill populations, because the species is highly specialized, and that old growth conditions were optimal or essential. While Tanner was aware that ivorybills bred successfully in an area that was predominantly second growth, at Mack’s Bayou, he glossed over this fact in the monograph, and became more dogmatic about old growth as a requirement in later years. Snyder and some others have contended that the ivorybill is a generalist. According to Snyder, “the data available on diet and foraging methods simply do not provide compelling evidence for strong feeding specialization.” Snyder goes on to suggest that “[i]ts apparent skill in exploiting recently dead timber, coupled with its ability to feed in a variety of other ways, may even have given it some significant foraging advantages over the pileated woodpecker, a species apparently much less capable of bark stripping. Indeed, the pileated woodpecker, like other Dryocopus woodpeckers, may well be more of a food specialist than any of the Campephilus woodpeckers.” (p. 37). As I see it, there are elements of truth in both models, but neither is complete. In addition, I think that each model relies on at least one flawed premise. The old growth/virgin forest component of Tanner’s model fails to account for the facts that the Singer Tract population was dwindling even before logging began in earnest and that birds appear to have remained in the Tract until well after it had been extensively logged. Tanner suggested another possibility, “perhaps the greatest factor reducing the rate of ivorybill reproduction is the failure of some birds to nest. One reason for their not breeding is immaturity, for it is probable that ivorybills do not nest until they are two years old. Another possibility is that the quantity of food available to the woodpeckers may determine whether they will nest or not.” (p. 83). Tanner struggled to account for the fact that the ivorybill population at Singer was dwindling by the mid-1930s, even though overall habitat quality had, if anything, improved relative to what it had been a few decades earlier. He attributed the higher relative abundance in previous years to tree mortality due to fires that took place in 1917 and 1924. Tanner also recognized the probable importance of fire in the pre-contact era, although he seems to have been unaware of the ways pre-contact Native Americans used fire, both for agriculture and habitat management. (The impacts of Native American fire use were almost surely different from what occurred in the 20th century Singer Tract). Neither Tanner (whose study predates the emergence of the discipline) nor Snyder, take environmental history sufficiently into account. There had been major ‘changes in the land’ long before large scale logging began in the southeast and before the reports of local abundance on which Snyder relies. These changes include: the post-contact collapse of Native American civilizations, the introduction of European plant and animal species, the clearing of log jams on major and secondary North American rivers, habitat fragmentation due to the plantation economy, and the near extirpation of the beaver. All of these elements likely contributed to a major decline in ivorybill populations. Ivory-billed woodpeckers likely concentrated locally in response to major disturbances, regardless of whether forests were old-growth or advanced second-growth, and this type of specialization caused birds to congregate, making it easier for collectors to kill them in large numbers in short periods of time. Snyder likely misinterpreted this collection of large numbers of Ivory-bills in short periods of time as reflecting a greater regional abundance. In contrast, and more consistent with Tanner, this ecological response to disturbed areas led, in some places, to the collectors extirpating regional populations. In the latter part of the 19th century, hunting probably sped the collapse of the remaining population, but Snyder’s claim that available data on diet and foraging methods do not provide compelling evidence of specialization fails to account for the anatomical and other evidence that suggests otherwise. It also fails to account for the Pileated Woodpecker’s far more extensive range and ability to thrive in a wider variety of habitats, including badly fragmented and degraded ones. I made some of the case for specialization in a series of recent posts, but there’s more to add, especially with regard to ants. In one of those posts, I hypothesized that the inability to exploit ants as a food resource was a key component, perhaps the primary component, in explaining the decline of the ivorybill. A commenter asked whether there’s evidence to support the idea that ivorybills and other Campephilus woodpeckers don’t feed on ants and also whether there’s evidence to support the idea that Campephilus woodpeckers don’t regurgitate. Adult Campephilus woodpeckers rarely feed on ants but do not feed them to their young. They make frequent trips to the nest with food items stored in the bill or at the back of the bill. (M. Lammertink, pers. comm.) Dryocopus woodpeckers and those in closely related genera (the “tribe” Malarpicini) feed their young by regurgitating, while other woodpeckers do not. (Manegold and Topfer, 2012). I think the capacity of Pileated Woodpeckers to consume ants in large quantities and to feed them to their young is a significant distinguishing factor and that Tanner was correct in suggesting that food supply was a major limiting factor on Ivory-billed Woodpecker populations. Ants comprise up to 33% of the world’s terrestrial animal biomass. In Finland, they comprise as much as 10%. In tropical forests, the percentage is much higher, exceeding vertebrate biomass by 400%. Tanner’s comparative analysis of available ivorybill and pileated food did not include ants, so Tanner’s comparative estimate of available insect prey – suggesting that pileateds in the Singer Tract had access to approximately four times what ivorybills did – was in fact extremely low. Tanner’s dissertation concludes with a discussion of Audubon’s ivorybill dissection, something that was omitted from the monograph. While I had a passing familiarity with the Audubon material, I had not looked at it carefully. Nor had I compared his ivorybill and pileated dissections. Tanner wrote: “The proventriculus is both muscular and glandular. Audubon’s drawings and text indicate that the proventriculus of a Pileated is much larger in proportion to the stomach than is the case in the Ivory-bill.” Audubon described the ivorybill proventriculus as being only minimally wider than the esophagus. By contrast, the pileated proventriculus as “an immense sac, resembling a crop, 2 1/4 inches in length and 1 and 5 twelfths in width,” or nearly three times as wide as the esophagus. Audubon’s drawing of Ivory-billed Woodpecker digestive tract showing slightly widened proventriculus. Audubon’s drawing of Pileated Woodpecker digestive tract showing large, sac-like proventriculus. The proventriculus and stomach of one of Audubon’s specimens contained “a vast mass of ants and other insects”. According to Bent, Beal found one pileated stomach that contained 2,600 ants. (Others contained fewer, 153 and 469, according to Sutton.) Thus, it’s clear that even if ivorybills sometimes ate ants, they lacked the capacity to consume them in large quantities, let alone feed them to their young. This supports Tanner’s view that specialization was a limiting factor on ivorybill populations. I’ve previously suggested that this might apply only to breeding season, but it seems reasonable to infer that it’s a factor year-round, based on the differences in proventricular structure. All of that said, I’d argue that this specialization should not necessarily be read to include dependence on large tracts of mature, contiguous forest. The data from the Singer Tract suggest that even under these ‘optimal’ conditions, breeding was limited. And the fact that the Mack’s Bayou birds bred successfully in an area of second growth suggests that birds could thrive under ‘suboptimal’ conditions. The extent to which survival might be possible in fragmented habitat is less clear, but Snyder (citing Jackson) refers to the Mississippi population of six pairs in a 19.2 square mile forest that Tanner missed; the tract is less than 1/6 the area of the Singer Tract and is smaller than many contemporary wildlife management areas. The tract, known as Allen Gray Estate, was west of Skene, Mississippi in Bolivar County; some or all of it is now part of Dahomey National Wildlife Refuge; the US Fish and Wildlife Service Habitat Management Plan for the refuge (2013) states that the forested portion of the refuge comprises 8100 acres and provides this historical information, “Dahomey NWR is located on the grounds of the old Dahomey Plantation founded in 1833 by F.G. Ellis and named after the homeland of his slaves. Much of the land west of the refuge was probably cleared for cultivation around this time. The land went through several owners and was purchased by Allen Gray in 1936. The portion that became the refuge was known as the “Allen Gray Woods”. This was the only significant portion of the plantation still forested.” This 8100 acre figure is 25% lower than the figure reported by Jackson and Snyder. While I have been unable to find a detailed logging history of Bolivar County, it is in the heart of the Mississippi Delta, which was known for its plantations. Between 1900 and 1940, Bolivar County was more densely populated than Madison Parish: 39.1 people per square mile as opposed to 18.9 in Madison Parish in 1900, 78.92 as opposed to 22.78 in 1930, and 74.57 as opposed to 28.33 in 1940. Based on population density and the number of towns, it seems self-evident that the habitat in Bolivar County was considerably more fragmented than was the Singer Tract. Thus, there is good reason to question Tanner’s old growth model as well as the idea that large contiguous tracts of mature forest are required. Similarly, there’s good reason to question Snyder’s argument that hunting rather than specialization was the primary cause of the ivorybill’s collapse. Efforts to reintroduce the beaver in the southeast began in the 1930s, and the population has been growing ever since. Beavers injure trees by partially or fully girdling them and by altering hydrology, which weakens or kills trees at the edges of the ponds they create. Beaver damage renders trees more vulnerable to infestation by ivorybill prey species, something we’ve observed repeatedly in our search area. In Tanner’s day and in the late 19th century, the beaver was barely a part of the southeastern ecosystem, but by the 1950s, beavers again were playing a role in altering southern forests, whether mature or successional. If the ivorybill was able to survive the logging of the last large tracts of old growth forest, as I think it was, the reintroduction of the beaver may have been central to its persistence. If this hypothesis is valid, there is considerably more potential habitat today than there was in Tanner’s era; much of this potential habitat has been overlooked or dismissed in organized search efforts; and the dismissals of post-Tanner reports based on his habitat model rely, at least in part, on a false premise. To expand on some of the data included toward the end of the March trip report (which is worth reading in in conjunction with this post), I thought it would be informative to provide a season by season and sector by sector breakdown of the scaling I and others involved with Project Coyote have found since the spring of 2012. To do so, I’ve gone through my notes and photographs and have done my best to reconstruct the data collected. While not complete (I’m quite sure a good deal more scaling was found in Sector 3 during 2013-2014, for example), I think this breakdown is a fairly accurate reflection of what we’ve found over the years. As discussed in previous posts, I think extensive scaling on hickory boles is the most compelling for Ivory-billed Woodpecker. Bark on this species is thick, dense, and usually remains very tight for a long time. Extensive scaling on sweet gum boles and oaks (upper boles and large branches) is second among work that I’ve found. Work on small boles, and higher and smaller branches is somewhat less compelling and is more significant for its abundance. Some of the high branch scaling and work on smaller boled sweet gums may well have been done by Pileated Woodpeckers (and possibly by Hairy Woodpeckers), but the abundance, the presence of large bark chips in many cases, the way it appears in clusters, and the fact that Pileateds scale infrequently suggest a different source for much of it. I have excluded all work where squirrels are suspected but have counted one tree, a hickory found this year, on which the work could well have been that of a Hairy Woodpecker. Hairies do forage for Cerambycid beetles just under the bark, but they’re only capable of removing tight bark in small pieces; their work on hickories is perhaps more accurately described as excavation through the bark. The trail cam images toward the end of this post are the best we have (out of many thousands of hours of coverage) showing how these species forage on suspected ivorybill feeding trees. All trees were live or recently dead (twigs and sometimes leaves attached). All scaling was on live or recently dead wood. ~15% had scaling on boles (a few of these were large trees). The majority of work was on crowns, including larger branches. Fallen trees were included when woodpecker involvement was evident and bark was tight. All trees were standing; scaling was on boles and was very extensive (the tree shown on the homepage is one example) with one exception from this year . Insect tunnels were visible in all examples. An additional hickory with a modest amount of high branch scaling was found in Sector 1 this year but was not counted for this analysis. All oaks had scaling on large branches; one also had some on the bole. All oaks in Sector 2 were found in a single cluster. We have some information on forest composition in Sector 3, and it appears that sweet gums make up approximately 19%, oaks upwards of 35%, and hickories somewhere under 10%. Sectors 1 and 2 may differ and be more varied in overall composition. The overwhelming preference for sweet gums relative to their abundance stands out. The scaled oaks are a mix of species, one Nuttall’s, one willow, the others unidentified. In Sector 3, I am treating the compact stretch from the location of Frank Wiley’s sighting last spring/downed sweet gum top where we had the camera trap to just south of our current deployment as a cluster. The estimate of 23 trees being found in this area is conservative. I have only found one instance of recent scaling north of the location of the downed limb/Frank’s 2015 sighting. The main cluster has been in the same vicinity this year and last, with additional work scattered around farther south. Two of the hickories are within 30 yards of each other, approximately half a mile from the cluster, and one was on the edge of the concentration. It also may be significant to note that we found a cluster of old but intriguing cavities in the same vicinity as the Sector 3 concentration in 2013-2014. Most of these seem to have fallen. The difficulty we’re having finding active, suggestive cavities is vexing, and may be the most compelling reason to be skeptical about the presence of ivorybills in the area. At the same time, finding Pileated cavities is difficult, even in defended home ranges. I’m treating Sector 1 as a single concentration; the vast majority of the work is on a natural levee where sweet gums are abundant. The entire area is considerably larger than the other clusters, but given the abundance and ease with which we’ve found sign there over the last five seasons, I think it constitutes one area of concentration. The sweet gum work Tom and I found on that day was perhaps half a mile north of this cluster, within 100 yards of the hickory on the homepage. The other hickories found in the 2013 and 2014 seasons were not far away, no more than 500 yards apart as the crow flies. There’s obviously some bias here, since there’s a relationship between finding feeding sign in a given area and spending time there. Nevertheless, I have little doubt that the putative ivorybill work tends to be clustered. I also have little doubt about the strong preference for sweet gums, since I’m not looking at tree species when I look for scaling. The degree to which sweet gums are favored has only become clear over the last year or so. Frank pointed out this data does not reflect most of the scaling that likely exists in relatively close proximity to the Sector 3 cluster but cannot be quantified because it is in an area we have intermittently visited due to inaccessibility. Only two or three examples are from this area, which has been visited a handful of times. I’m planning to do a few more posts drawing on material I’ve found in Kroch Library’s Rare and Manuscript Collection at Cornell. There may be an intervening post or two on other topics. While Tanner’s monograph is well-known, the reports he wrote for the Audubon Society at the end of each season are not publicly available, except in the archives. The contents of these reports call some conventional wisdom about the species into question. First and perhaps least important, it seems to be commonly believed that the John’s Bayou birds were the only remaining ivorybills in the Singer Tract when Tanner visited in December 1941. They were indeed the only birds he saw, as noted in his report (the first document below); however, he found feeding sign in the Mack’s Bayou area and suggested that at least two more birds remained, one at Mack’s Bayou and another in Greenlea Bend. As I read the report, Tanner referenced Bick’s observation in August ’41 (discussed here), and the context suggests that he related it to the John’s Bayou family. Other interpretations are possible, including that this was another family group that was passing through the area, which would mean that the remaining 1941 population was even larger. In Ghost Birds, Steven Lyn Bales provides a full accounting of Tanner’s population estimates, but earlier books by Hoose and Jackson gloss over the likely presence of the other birds. Hoose (p. 120) wrote that James and Nancy Tanner “maybe heard a third” at Mack’s Bayou. (The source of this information is not identified.) Jackson (p. 132) has Nancy Tanner seeing a male and a female in December 1941. Both Bales and Hoose are clear that she saw the pair in 1940; per Bales, the actual date was December 21. While there’s no way of knowing whether the birds Bick saw were the John’s Bayou family, I suspect that they were. I also think it’s reasonable to infer, as Tanner did, that this group bred successfully in 1941 (possibly an important point given the disturbance to the habitat). If Bick’s birds were the ones from John’s Bayou, it seems the male disappeared sometime between mid-August and December. Given the consistent presence of this family group in the vicinity for nearly a decade, there’s perhaps a hint of wishful thinking in Tanner’s suggestion that the male “might have moved away” due to the logging. The next interesting tidbits come from a 1938 interim report that Tanner sent to the Audubon Society, under the terms of his fellowship (the document below and accompanying map). The report includes a reference to a non-breeding pair in the Mack’s Bayou area. This pair does not show up in Tanner’s published counts, either in the monograph or in his dissertation. It seems possible that Tanner concluded the pair that was seen around Mack’s Bayou and the pair with two young that Kuhn found later were one and the same, erring on the side of caution in his final population estimates. What stands out in both of these documents is the difficulty Tanner and Kuhn faced when trying to find ivorybills other than the John’s Bayou family. This is a topic I’ve touched on in several other posts because of the common belief, fostered by Tanner in later years and advanced by many 21st-century “skeptics”, that ivorybills should be easy to find. During his brief, two week visit in 1941, Tanner couldn’t get to Greenlea Bend at all and didn’t find the Mack’s Bayou bird, although he found evidence that it was still there. The 1938 report illustrates how hard it was to find ivorybills even more explicitly. Kuhn and Tanner were unable to locate a pair that had been seen by others in a fairly circumscribed area, although it’s possible that Kuhn happened on this pair and the young of the year on June 15th. Beyond that, it took Tanner and Kuhn “two or three weeks” to find an ivorybill in an area where there was “an abundance of feeding sign”, and Kuhn only found the bird in question by following it to the feeding sign from a known roost. It seems that, while ivorybills may sometimes have been “noisy and conspicuous”, they were for the most part quite the opposite. Materials are courtesy of the Division of Rare and Manuscript Collections, Cornell University Library. These two photographs, taken by Tanner in 1938 and published in his dissertation, have not been otherwise widely disseminated or (to the best of my knowledge) reprinted elsewhere. Each is interesting in its own right, and not just because they add to the small body of indisputable ivorybill imagery; the first shows the behavior of a near-fledgling (Sonny Boy) in the nest and the second for the position of the male’s crest, which is more recurved than in most or all other stills. Another series of rare images is here. Images are Courtesy of the Division of Rare and Manuscript Collections, Cornell University Library. At an IBWO Recovery Team meeting during 2007, a report was shared by Dr. Nathan Schiff and his colleagues at the USDA Forest Service’s Southern Hardwoods Laboratory that more formally described many of the paradoxes that have been discussed in this series of posts. It provides more information on what is known today about the ecology of the wood boring species documented as having been fed upon by Ivory-billed Woodpeckers. Schiff and his colleagues point out that the larvae Tanner collected from a John’s Bayou nest cavity and those described from stomach contents don’t prefer sweetgums, don’t live in high branches, and spend the bulk of their lives in the heartwood, often in the lower parts of trees. While it’s not mentioned in the Schiff et al. paper, Mallodon dasytomus or what Tanner called Stenodontes (by far the largest single food source in his sample of remains from the nest cavity described above) is commonly known as the “hardwood stump borer”, and Neandra brunnea, a close relative of another known prey species, Parandra (or Hesperandra polita), is called the “pole borer”. These beetles have a life cycle of 3-4 years. The authors point to direct evidence that of the six species of insect identified in Tanner’s monograph, none would use wood consistent with the high branch/sweet gum focused foraging model. In addition to Mallodon, and P. polita, these species are: Neoclytus caprea (banded ash borer), Dynastes tityus (Eastern Hercules beetle), Alaus ocualtus (eyed click beetle) or a close relative, and an unidentified Scolytid or bark beetle (not found by Tanner.) We have found both P. polita and A. oculatus adults on suspected feeding trees. Scolytids are tiny. Neoclytus begins its one year life cycle in early spring; the larvae start feeding under the bark and then burrow into the sapwood, where they pupate and spend the winter before emerging as adults. The species prefers ash but may also occur in hickory, oak, and elm. It is found in downed logs, as well as standing trunks and limbs of stressed to dead trees. Dynastes tityus or Hercules beetle larvae live and feed in the “rotting heartwood of logs and stumps.” Alaus larvae are predatory on Cerambycid larvae and live in decaying stumps and logs; eggs are laid in the ground. In addition, the authors point out that at least some of the larvae Tanner found under bark on higher branches (p. 42) require wood that’s in an advanced state of decay, when bark would be loose. The insect larvae identified for Tanner (Mallodon, Alaus, Neoclytus, and Dynastes) came from remains he found in nest debris. I think this suggests he may have failed to observe or have unduly downplayed one or more foraging behaviors related to obtaining food for nestlings – excavation of very decayed stumps and logs and extensive scaling on boles in particular – since these are lower dwelling species and two of the four inhabit wood that’s in an advanced state of decay. My anonymous correspondent disagrees with my reading of Tanner but makes a very interesting observation that sheds important new light on the data. Schiff et al. point to an apparent contradiction; none of the food items found in the nest reflect the preference for high branch foraging that Tanner described. The importance of large Cerambycid larvae (especially Mallodon or Stenodontes dasytomus) in the feeding of young ivorybills at Singer Tract remains unclear. Tanner’s observations indicate that most foraging events involved a substrate (recently dead or dying branches) that doesn’t support these large wood-boring larvae. Tanner reported that Mallodon and other large larvae that were “frequently carried in the bills of adult Ivory-bills”. Some fragments of larvae that were found in the remains of at least one nest cavity had to have come from boles or large, lower branches and were likely to have been obtained from longer dead wood, at least in some cases. It appears that attention today on the Cerambycid larvae “paradox” may have been founded in part on a misreading of Tanner. The Cerambycid and other large larvae found in the three stomachs reported above were from birds collected in August and November, well after the breeding season. Because Mallodon is so large, was the most abundant prey species found in the nest, was identified in one of the stomachs, and was quite likely the species found by Wilson and others, many have interpreted Tanner as saying that it was the primary prey species. It was undoubtedly an important and calorically rich one, but Tanner’s observations suggest that smaller larvae played a more important role, at least in the case of the John’s Bayou birds. While he frequently saw adult ivorybills carrying large larvae in their beaks, he observed the birds carrying large numbers of “small” larvae even more frequently. He noted the apparent conflict between his observations and what was found in the nest debris and resolved it by hypothesizing that the smaller insect parts probably remained “imbedded in the feces” and were “removed when the adults cleaned the nest” (pp.40-41). Thus, while there is direct evidence that large wood borer larvae were part of the ivorybill prey base, Tanner’s overall interpretation was that smaller larvae were more important during the breeding season. (pp. 40-41, 51-52). To reiterate, Tanner stated specifically that while most of his observations involved scaling of high branches, presumably for smaller larvae, he also observed scaling on boles where larger larvae dwell. Tanner suggested that foraging on trunks took place when trees were “longer dead” and that ivorybills “move downward with the progression of shallow borers” (p. 41) The balance of his observations (27.8%, a not inconsequential number) involved digging for “deeper-living” larvae that spend most of their lives in the heartwood, between the ground and the large lower branches. In their unpublished manuscript, Schiff et al. concluded that: the “. . . Ivory-billed Woodpecker is an opportunistic feeder with catholic tastes that eats beetle larvae where it can find them and that it probably digs for them with its powerful bill. ” This conclusion was intended to challenge Tanner’s finding that food supply imposed a limitation on ivorybill nesting success, but a close reading of Tanner suggests this conclusion actually is not at variance. It is clear now that Ivory-billed Woodpeckers could and did forage by digging into older boles like Pileateds, though less frequently. It is also clear that they scaled bark at all levels. The new revelation for many of those interested in ivorybills today is that this species showed a preference for stripping bark in pursuit of large numbers of smaller larvae in recently dead and dying trees and carried these smaller larvae en masse to their young. I think the foregoing observations make a lot of sense. As discussed, perhaps ad nauseaum, I have some doubts about what I take to be Tanner’s conclusions about decay class. I have questions about the way he characterized his data on tree size and wish he had quantified scaling on branches relative to scaling on boles. I also question his suggestion that scaling on boles was done on longer dead trees (and the rationale that trees die from the top down) because it doesn’t account for the fact that the larger bole dwelling Cerambycids can attack injured live trees and hasten or bring about mortality, as was the case with the suspected feeding tree shown on the homepage. I have little doubt about his observations at the nest. For one thing, the number of is considerably greater, 159 as opposed to 101. There is some reason to think Tanner was at least partly correct with respect to variability and scarcity of this food supply, especially in the higher branches. As noted in the previous post, Tanner found no Cerambycid larvae at all in a random sampling of cutover plots near Horseshoe Lake. The location of these surveys was likely between the Bayou Despair and Greenlea Bend home ranges and not far from where two young birds were seen in 1932. Ivorybills were disappearing from these two home ranges, as well as from the nearby Little Bear Lake range, and the three ranges only produced one successful nest (Greenlea Bend, 1937) between 1934 and 1939. (p. 39), and it seems possible that scarcity of this food supply was a contributing factor. Tanner specifically looked for insect larvae “from several situations similar to places where ivorybills fed”. This was presumably not a random sample. While details about these “situations” were not provided, they included: under bark of dead sweet gum and willow oak limbs (presumably downed), under the bark of a Nuttall’s oak (condition and part of tree unspecified but presumably a downed limb or limbs based on the species found), and the trunk of a dead hackberry. As might be expected, he found Mallodon, P. brunnea, and A. oculatus in the hackberry bole. He found Urographis (now Graphisurus) fasciatus and Leptostylus sp. in both species of oak and in the sweet gum. These are small Cerambycids (adults up to 15 mm). He found small Cerambycids, Aegomorphus decipiens (now modestus) under sweet gum bark and Xylotrechus colonus under the willow oak bark. In addition, he found Pyrochroidae (torch beetle) larvae, possibly Dendroides canadensis, in sweet gum and Nuttall’s oak and unidentified Elaterids and Buprestids in the Nuttall’s oak. Questions remain. Some of these larvae, the Elaterids and Pyrochroids in particular, are found under loose bark in decayed wood, suggesting that at least some of the infestation took place after the limbs Tanner examined had fallen. Aegomorphus also feeds in “soft, decaying hardwoods.” Graphisurus fasciatus is a common species that prefers trunks and large branches. Xylotrechus colonus, prefers “recently killed trees” and is described as “one of the commonest eastern Cerambycids”. At the same time, Tanner’s very limited random sample suggested that high branches had considerably less available substrate and food than other tree parts. This may suggest that sporadic, localized outbreaks of larval infestation in high branches are crucial for breeding. There are a couple of added twists to this story. To restate and expand on the foundation of my hypothesis about diagnostic feeding sign: Campephilus anatomy, and especially that of the northern triad (Imperial, Cuban ivorybill, and U.S. ivorybill), is highly specialized. Members of this genus are built to scale bark with greater speed and efficiency than any other woodpecker species, but they are also certainly capable of digging. When they dig, they may be powerful, but I suspect their morphology makes excavation a less efficient foraging strategy. In contrast to Pileated Woodpeckers, which have evolved to make perpendicular blows, ivorybills have pamprodactylous feet (an evolutionary adaptation that rivals the opposable thumb in terms of how radically it differs from other picids), longer necks, longer, stiffer tails, and larger, broader bills. All these adaptations enable them to deliver strong lateral blows but probably impact their ability to excavate. This may explain why many of the foraging pits shown in the Pearson photograph and in Plate 11 are skewed and why ivorybill nest cavities are asymmetrical. It might also explain why ivorybills dig relatively infrequently during breeding season and instead undertake long daily circuits to strip bark and gather larvae, both large and small, for their young. Ivory-billed Woodpeckers don’t eat ants or termites and don’t regurgitate. They must obtain live, and when possible large, beetle larvae or large quantities of smaller ones. It’s beyond dispute that they do this most often by scaling bark and finding these insects at or near the exposed wood. Based on the presence of Neoclytus in the nest, it’s reasonable to infer that some prey species are taken early in the life cycle, before they burrow into the heartwood, while others simply live under bark. In addition, several species (Mallodon and H. polita at least) may be exposed when bark is stripped from the bole and their larvae are digging exit tunnels but have not yet sealed their pupation chambers. This is the time when the larvae are largest and most nutritious. This is the substrate in which Tanner found the highest concentration of food, and ivorybills are uniquely adapted for exploiting this opportunity. I believe we have seen evidence of this behavior on some hickories, sweet gums, and oaks in our search area. One or both of these foraging strategies may be keystones. Fluctuations in the availability of these particular food sources might have a significant impact on nesting success. Whether or not I’m exactly right about all this, I think there are several important points that deserve to be reiterated. The Singer Tract ivorybills “usually” or frequently fed on high, freshly dead sweet gum and Nuttall oak branches; what they were feeding on remains unclear; however, there is no doubt about the importance of the prey collected (whatever it was) at the treetops for raising young. Specifically, on April 23, 1939, Tanner observed both adults feeding “Baby Bunting” from prey captured from the top of a dead pecan (hickory), and also the long flights these three, along with “Sonny Boy” (the previous year’s young, still with adults), made from one foraging tree to another. There is also no reason to doubt that prey from treetops made up a substantial part of what was fed to the young before fledging. Ivory-billed Woodpeckers in the Singer Tract could and did feed at all levels and on wood in all stages of decay, but during breeding season, at least, they took most advantage of more recently dead and dying trees. Despite the habitat and tree species preferences documented by Tanner during the 1930s, the last few ivorybills could and did feed in areas and on tree species that Tanner did not document as being heavily used during his study. This was mostly in the 1940s, after massive cutting was under way. Subsequent interpreters of Tanner have inferred that these tree species and areas were unimportant or unsuitable, and some of Tanner’s later statements may have abetted this misunderstanding. The takeaway is that ivorybills will feed on a variety of tree species, provided the trees are stressed and infested with wood boring larvae that can be quickly collected by scaling bark. Prey species were most heavily concentrated in what Tanner called “hard but partly punky” stumps. Though it’s not explicitly stated, this class is likely to include the boles and large lower branches of standing trees, including Cerambycid infested trees that have not yet succumbed. Despite popular perceptions, large trees are not a requirement. Notwithstanding our disagreement about how to characterize foraging frequencies and size class explored at length in the first post in this series, my collaborator and I agree that insect abundance, not tree size per se, is the most significant factor. The foraging behavior documented by Allen and Kellogg and the nesting successes in mostly second growth but fire damaged forest (Mack’s Bayou) earlier in the 1930s support this interpretation. I hope this series of posts will prove useful to other searches and that it provides greater clarity about ivorybill foraging behavior. Addendum, March 26: A biologist wrote to point out that I may have been regurgitating conventional wisdom on the subject of Campephilus regurgitation. Some of the literature states that they do feed their young in this manner, and there is language in Tanner to suggest this may be so for ivorybills (pp. 74-75). “Often it seemed to be jerking as if working food from the back of its mouth.” As I read Tanner, the number of larvae that may have been regurgitated seems small, a single grub in at least one instance. The passage in Allen and Kellogg (mentioned in the comments) involved termites, and it is highly speculative. And I recall reading that ivorybills were hunted for food specifically because they didn’t taste of formic acid, unlike pileateds. At present, I don’t think this information calls for a major revision of the hypotheses presented here, but I plan to do some additional research and may have more to say on these subjects in future. I’ll be completing a week in the field today and expect to post a trip report before too long. As a preview, I’ve found an unprecedented quantity of recent high branch and upper bole scaling this week, all of it on sweet gums. The second observation from the Singer Tract I want to discuss took place in May 1932, when Audubon Society President, T. Gilbert Pearson and Audubon Sanctuary Director Ernest G. Holt were the first ornithologists to observe Ivory-billed Woodpeckers (a minimum of three separate individuals) on the Singer Tract. As discussed in an earlier post, a newspaper account describes Pearson’s observations as follows: “The birds were feeding on stumps of rotting trees, the tops of which had been broken off. A favorite place for feeding is also on dead limbs at or near the tops of the very tall sweet gum trees found abundantly in this region.” It seems likely that some of these “stumps” broke due to having been weakened by larval infestation, although other factors undoubtedly were in play. Pearson described his visit to the Singer Tract in Bird Lore (not available online) and included a photograph of the tree on which an ivorybill was first sighted. The tree has been heavily worked on by woodpeckers, and notwithstanding the poor quality of the image, the excavations look similar to some discussed in this speculative post. Pearson’s observations present an interesting comparison with Tanner’s from later in the 1930s. Tanner wrote that “Ivory-bills in Louisiana usually feed high in the tops of dying trees, but they are not averse to coming close to the ground.” If there was any question, Tanner’s Plate 11 shows digging similar to that pictured by Pearson above and also shows that foraging occurred close to the ground. Since Tanner’s monograph was published, a misunderstanding has arisen – that the Singer Tract birds were canopy specialists that rarely or never foraged on boles or near the ground. Tanner contributed to this misunderstanding after the publication of the monograph by dismissing reports of birds being flushed from near the ground and using this as one of his arguments for designating the species as extinct. If there was any doubt that Ivory-billed Woodpeckers foraged on boles (all the way to base), at least two of the four plates in the monograph (7 and 9) show scaled trunks; another (11) shows a hackberry bole (or stump) that has been scaled and excavated. Allen and Kellogg (1935) reported watching a female ivorybill foraging on the ground “like a Flicker”, and their photographs of foraging show feeding to near the ground on multiple small, rotting pines in Florida and on a “gum” in the Singer Tract. Tanner did not quantify the frequency with which the Singer Tract birds foraged at different levels beyond saying that they “usually” fed high, but these remnant populations were clearly not averse to feeding low when circumstances required it, and as will become clear in the next post, there’s good reason to suspect that foraging lower on trees might have happened more frequently outside of breeding season. In the back and forth leading up to this post, my interlocutor had an important insight. He suggested that some misunderstanding has arisen regarding the species of wood boring beetles that would be most important as prey for Ivory-billed Woodpeckers, at least during breeding season. Anecdoctal reports from many familiar with ivorybills, including Alexander Wilson and John James Audubon, have led to an emphasis on large Cerambycid larvae as a major prey item. Of the three Ivory-billed Woodpecker stomachs examined (p. 50), Cerambycid and other large beetle larvae made up high percentages of the animal matter identified in each stomach. It’s clear that ivorybills do feed extensively on large Cerambycid larvae and may prefer them at times, but as with all things ivorybill, nothing is straightforward. There will be more on this in the next post. Tanner was the first and only observer to attempt to quantify at the availability of wood boring larvae and foraging substrates used by both Ivory-billed and Pileated woodpeckers. As I read Tanner, ivorybills, but not Pileateds, fed under the tight bark of dead on high limbs; both species feed on “hard but partly punky” stumps, and Pileated Woodpeckers (but not ivorybills) feed on “punky, and punky and rotten” limbs, stumps and logs. I think Tanner was categorical about this in both the table and the text on p. 52. My contributor strongly disagrees and reads Tanner as not dismissing the possibility that ivorybills foraged on more decayed wood, including “punky and rotten” limbs, stumps, and logs, only that he did not observe this for the successfully reproducing Ivory-bills at John’s Bayou during his three year study. Either way, crucial to the hypothesis that food was limiting to Ivorybills during the breeding season was Tanner’s sampling of wood boring insects among these three different substrates in the Singer Tract. In May of 1939, Tanner did a survey in a freshly cutover area near Horseshoe Lake. He sampled eight .25 acre plots. He expressed some doubts about the data because he had difficulty finding dead limbs among the smashed tops but only to the extent that the “amount of Ivory-bill food discovered was undoubtedly less than was actually there” and the “calculated proportion of Pileated to Ivory-bill food was quite a bit greater than normal.” (pp. 50-51.) While two young birds were seen in the vicinity of Horseshoe Lake in 1932, this area was not in any of the home ranges delineated by Tanner, and he did find Cerambycid larvae under the bark of dead limbs that he apparently collected, presumably in non-random fashion, from downed wood in the John’s Bayou area. I’ll discuss these findings in the next post. These caveats aside, the findings are dramatic because they seem to conflict with the observations mentioned above and even some of Tanner’s observations and data, particularly with respect to Cerambycid larvae. The more decayed type of wood was over 12 times more abundant than the hard but punky stumps, the scarcest substrate in the sampled area but also the one with the highest relative abundance of Cerambycid larvae. Thus, this class seems to have offered by far the highest return on foraging investment, 237 cubic centimeters of insect volume in a mere 30 cubic feet of wood. The higher, freshly dead limbs contained no Cerambycid larvae at all. Tanner estimated the total volume of insects for this class was 27 cubic centimeters in 80 square feet of foraging surface, a truly minuscule quantity. (He measured the surface area rather than the volume in this class.) The volume of insects in the most decayed substrates was 1154 cubic centimeters in 386 cubic feet of wood, abundant but not nearly as concentrated as in the “hard but punky” stumps. This led Tanner to estimate that Pileated Woodpeckers in the Singer Tract had access to 40 times more food than ivorybills (p. 51) and to infer that this explained the much higher density of Pileateds (about 36 for each ivory-bill) there. I suspect that there’s another major factor that accounts in part for this difference. I’m puzzled by the fact that Tanner never mentioned ants and termites when comparing ivorybills and pileateds. Long before he conducted his study, ants and termites had been documented as a primary Pileated Woodpecker prey species. In another study of 23 PIWO specimens, also cited by Bent, ants comprised 60% of the stomach contents. There’s no evidence to suggest that ivorybills ever preyed on ants. Pileateds can gather and regurgitate ants, termites, and their larvae in great numbers, whereas Ivory-billed Woodpeckers must bring live beetle larvae to their young. It does not seem farfetched to suggest that the Pileated Woodpecker’s ability to exploit this abundant resource is a major reason for its relative success and that the ivorybill’s inability to exploit it could have been a major limiting factor on population and fecundity. Tanner may have proceeded from the assumption that if there was competition between these two species, it would be for available “borers” (meaning beetle larvae), but the omission seems problematic and hence puzzling to me because it leaves a distorted picture of the degree of competition between the species and makes them seem more similar than they are in fact. It also skews the data Tanner presented and discussed on p. 51, since the volume of food available to Pileated Woodpeckers, but not ivorybills, in more decayed substrates would be substantially greater if ants were included. There’s no reason to doubt Tanner’s observations with respect to high branch scaling, but it still seems paradoxical that the John’s Bayou birds “usually” foraged on parts of trees that apparently contained a lot less food. We’ll explore this paradox in more detail in the next installment. I flew into Houston on February 4 and arrived at the search area on the morning of the 5th. Frank’s work schedule had precluded him from returning to the search area during my absence, and he was unable to get time off to join me this trip. Tommy Michot visited on the February 5th; we went to the northern sector, and passed the downed sweet gum top (actually a limb) found in April of last year. Project Coyote had a camera trained on it for some time but took it down due to equipment failure. The main stem, which reaches from the ground to about 20 feet up, had been scaled extensively, down to the base, over the course of the last month. Some of the work had been done no more than a few days prior to my arrival based on the condition of bark chips found at the base. We have a camera back on this top but have low expectations, since so much bark has been removed that it makes a much easier target for other species of woodpecker. While I don’t believe in the “curse of the ivorybill”, individuals and small groups of self-funded searchers face enormous obstacles and are dependent on equipment that’s often unreliable. Tommy and I measured a number of the largest trees in the area, and the biggest oaks and sweet gums are around 4’ DBH, with many more in the 3’ range. Here are some of the highlights: two Nuttall oaks: 137 cm/53.94”, 119 cm/46.85″; swamp chestnut oak 110 cm/43.31” four sweet gums: 124 cm/48.82”, 123 cm/48.43”, 110 cm/43.31″, 109 cm/42.91”. While ours was not a random sample, this table from a 1986 paper by Tanner (on data collected in the Singer Tract in 1938), is interesting for the sake of comparison. In his 1944 report on the Singer Tract, Richard Pough described sweet gums in the 5’-6’ DBH range as being characteristic of old growth conditions, and such trees were not uncommon in the 19th century. Impressionistically, at least, most of the ~4’ DBH sweet gums in our area are moribund and are likely to have lost their tops. I know of only one gum that appears to be in the 5′ DBH category. As of 2009, the national champion sweet gum had a DBH of 5’4.6″. The tree below could be close to that. Many, perhaps most, gums have at least some beaver damage. This may be contributing to the earlier mortality, both by stressing the trees directly and by creating the opportunity for beetles to infest them. I have long suspected that the decline of the beaver could have contributed to the IBWO’s disappearance, since beavers directly damage trees by gnawing and also stress or kill them by altering hydrology. 124 cm dbh sweet gum with beaver damage at the base, measured this week. The photo was taken in 2013, and the top of the tree has fallen in the interim. Beavers were extirpated from much of Louisiana by the early 19th century. As of 1931, populations were restricted to the Amite and Comite rivers in the southeastern corner of the state; they were reintroduced in other areas in 1938 and had established themselves in 21 parishes as of 1951. (Wylie Barrow, pers. comm.) Range expansion continued into the 1990s and after. They’re now considered a pest animal and appear to be found in all parishes. A recent paper suggests that the introduction of beavers into Magellanic Woodpecker habitat may have benefitted that species. I was on my own on February 6th, and I went and staked out the downed top for the better part of the morning. Nothing landed on it except for a Red-bellied Woodpecker that pecked and gleaned but did not scale bark or do any excavating. At approximately 9:30, I did a very aggressive series of ADKs. I heard a couple of loud single knocks that seemed to come from no more than a couple of hundred yards away and also a possible double knock. These came during a period when I was standing, moving around, and doing the ADKs, so I did not hear them very well. In addition, there were a few distant gunshots within about 15 minutes after the series, so I’m not very confident about what I heard. (These were the only shots heard all day.) I found some scaling the next day a couple of hundred yards away (discussed below). This gives me some reason to think the SKs were a reaction, not shots. Still I’d place these in the weak possible category. One highlight of the day was watching a pair of Red-shouldered Hawks in the act of mating. I returned to the same area on the 7th, with two cameras to deploy. One is aimed at a large sweet gum stub, about 20’ tall and well over 3’ DBH that I found last trip. The top had broken off shortly before my arrival. While it’s not discussed in Tanner, T. Gilbert Pearson, who was the first modern ornithologist to observe the Singer Tract IBWOs, described this type of “stump” as one of the species’ preferred feeding sites. This is a tree on which I found high branch scaling last year, before the top broke off. I expect this to be a long-term deployment. I also redeployed a camera on the downed top, although we’re not very hopeful about that location, since the scaling is so extensive and the bark has been loosened in many of the remaining unscaled areas. I walked south for a couple of hundred yards and found very fresh, large bark chips at the foot of a live sweet gum (there were two large gums ~3’ dbh about 10’ apart). There was extensive scaling on live or recently dead high branches of one or both of these trees. Because there had been a major rainstorm and accompanying minor flooding a week before and the chips were mud free, I can be sure the scaling took place after the rain, and since Tommy and I had spent considerable time in the area examining some other nearby scaling two days before, I strongly suspect this work was done on the 6th. I can’t help but wonder whether the possible single knocks came from whatever was doing the scaling; that would be consistent with my immediate impression when I heard them, both in terms of distance and direction. Nonetheless, my confidence level about the SKs is low given the gunfire. I don’t think the scaling and bark chips are consistent with squirrel; the chips are large and thick and do not show signs of having been chewed off; the ones collected weighed over five pounds. I met Tom Foti, who came in from Arkansas, on the morning of the 8th. Winds were high, with gusts approaching 50 mph. We decided it would be unsafe to venture into the woods, so we drove around the edges of the search area looking at the surrounding upland forest, much of which is impressive and mature. Tom is very enthusiastic about the area, ivorybills or not, and we’re hopeful that steps will be taken to protect and manage it appropriately. The car ride was a running lesson on southern forest ecosystems, and as I told Tom, I’ll count myself lucky if I retain 10% of what I learned. The next morning, the winds had dropped enough to make it safe to head for the swamps, and Tom and I visited the southern sector, an area where we haven’t spent much time lately. As mentioned in some previous posts, there has been a significant uptick in four-wheeler activity in the area, and it’s heartbreaking to see the destruction these callous individuals are causing. Fortunately, the damage is almost entirely limited to the periphery, and the deeper parts of the bottom are unscathed. The habitat types here are somewhat different, and the logging date is more recent, but it remains very impressive. We walked a long way and went to places I had never been, including a lower-lying flat with tree species I haven’t noticed elsewhere – shagbark hickory, bitter pecan, and overcup oak. We saw no recent feeding sign in any of these areas, except for some older work on a small sweet gum that I described as being about a grade B-. We then looped back along a different track, passing the spot where I recorded calls in March of 2013 and where we’d had a concentration of feeding sign in 2012 and 2013. We found nothing until we reached a location farther north that is within 100-200 yards of the tree shown on the homepage. Tom spotted a group of trees with bark scaling, some on boles and some on branches. Once again, this was not “grade A” work, but the concentration makes it more interesting than if it were one isolated example. We did not find any chips at the base of the snag that had been scaled on the bole, and the high branch work is not as extensive some. It’s worth pointing out that on many days, I’ll walk for hours and see nothing and then find either a dramatic example of scaling or a small cluster of it. Tom and I had probably walked 3.5 miles or more before finding this little cluster. I was on my own again on the 9th, and I opted to go on a death march to retrieve a trail cam from a tree deep in the swamp and proceed north from there. The tree is a large blown down sweetgum discussed and shown here. There was some fresh scaling on it that I suspect was done by a Pileated Woodpecker. There are nearly six weeks of images to go through, so it will take some time before we find out if there were any captures. As on the previous day, I walked for a couple of hours without seeing or hearing anything suggestive until I got to a part of the area we haven’t visited since last year, perhaps a quarter mile south of the southernmost point Tommy and I had reached earlier in the week. I found old sign, some of which was fresh last winter and some of which was older. I then found some fresh work on two trees in close proximity to one another. Some of the scaling was on a downed tree but was clearly done by a woodpecker, with chips and other characteristics that I consider to be suggestive. Since the chips were caked with mud, the scaling was a little over a week old. The other work was on one high branch, but conditions made it impossible to look for chips. 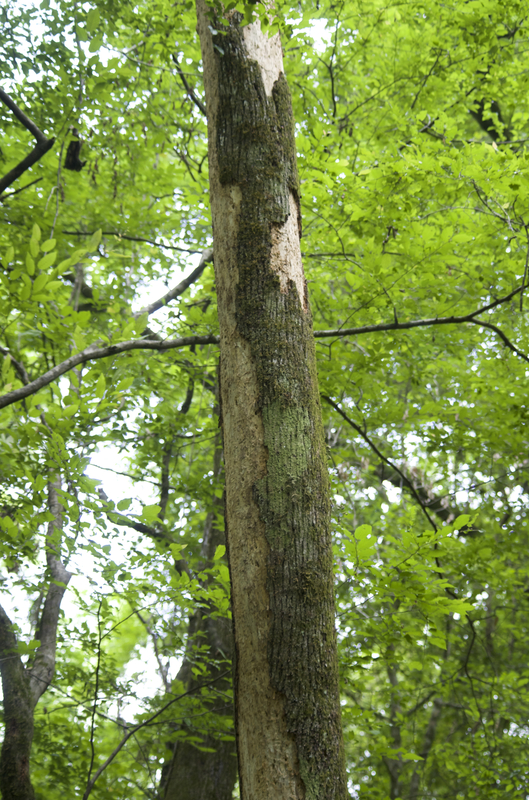 On the return hike, I found what I’m quite sure is Pileated Woodpecker work on a recently dead or dying hickory. Since we’ve found a number of hickories that we suspect have been scaled by Ivory-billed Woodpeckers, this was an unusual opportunity to do a direct comparison. In my view the work on hickories is the most compelling for ivorybill due to the density and tightness of the bark and the hardness of the wood. There are pronounced differences in the presumed Pileated and suspected ivorybill work on this species. The work on the homepage is suspected ivorybill. It is extensive, with huge contiguous areas, perhaps 20% of the entire surface, completely stripped, with evidence of bill strikes targeted at exit tunnels. The Pileated work is spotty by comparison. The bark chunks scaled from the tree on the homepage were large, dense, and thick, and there were no pieces of sapwood among them. By contrast, the suspected Pileated work involves very small pieces of bark that appear to have been removed by digging rather than scaling; there were also a few pieces of punky wood among the chips. I plan to return to the search area in late March and have another post or two in mind in the interim. The first two installments in this series, which was inspired by the discovery that squirrels are doing some of the bark scaling in our search area, are here and here. This installment will consider the appearance of the scaling itself, and the next will focus on pieces of bark; “chips” no longer feels sufficient to describe the spectrum of what we’ve found, and using more specific terminology may shed more light on what we think is diagnostic and why. I’ll begin with the work we are now presuming to have been done by squirrels. In retrospect, it’s easy for me to understand why I was fooled by this bark stripping. I was not seriously considering mammals as a source due in part to the extent of some of the work involved; I never saw incisor marks on the wood, something that’s often described as being an important indicator; similarly, I have been unable to find these marks in the photographs I’ve taken of stripping that we now presume to have been done by squirrels. In addition, I was somewhat misled by Plate 8 and the description of what Kuhn thought was diagnostic that his daughter shared with us. (Scroll down in this post to see where my thinking went astray.) It’s my current view that Plate 8 could conceivably be squirrel work. Tanner doesn’t state that he actually observed an ivorybill doing the scaling. Between 1937 and 1939, Tanner observed actual scaling a total of 73 times, but it’s not clear how many instances he might have photographed. In hindsight, the scaling in Plate 8 is not particularly impressive; the scaled patch is relatively small; the bark is thin and the hanging pieces may be an indication of removal by gnawing rather than bill strikes. Adhering bits of shredded bark and cambium are evident in some of the work we believe to be squirrel, including on the tree where we captured a squirrel stripping bark (albeit much smaller ones in that case). Small bits of bark and cambium adhering to downed sweet gum limb after presumed scaling by squirrels. In fact, I think one of the keys to recognizing that squirrels are likely responsible for removing bark is a ragged, shredded, or chewed up appearance to the bark and cambium, as in the examples below. The information we got from Mrs. Edith notwithstanding, I am going to examine the edges of scaled areas more carefully and be sure they are for the most part cleanly incised. This is one of the main criteria for ascribing the work to ivorybills (although by no means all Campephilus scaling falls into this category, and some can have ragged edges). As I’ll be discussing in the next post, I think that bark chip characteristics provide an even better diagnostic. Now let’s turn to targeted digging and the similarities between what we’re finding and the work of other Campephilus woodpeckers. In some of my previous posts on bark scaling I’ve mentioned “little or no damage to the underlying wood”. “Little” is the operative word here. In most if not all of the examples of scaling associated with large Cerambycid exit tunnels that we’ve been able to examine up close, there are also indications of targeted digging, and we have seen similar targeted digging on some of the higher branch work we’ve found. Targeted digging involves the expansion of individual exit tunnels in varying degrees. This can range from what appears to be little more than probing with the bill to deeper and wider excavations, but this excavation is incidental to the scaling, whereas in Pileated Woodpeckers, scaling on tight barked-trees is typically incidental to excavation. A magnificent series of photographs by Luiz Vassoler posted to the Flickr Campephilus group, showing a Crimson-crested Woodpecker scaling and doing targeted digging, is illustrative (scroll through to your right for the whole series). This is not to suggest that other woodpeckers can’t or don’t dig for larvae in a targeted way, only it’s more suggestive evidence for the presence of Ivory-billed Woodpecker in our search area, given the context and what’s known about the foraging behavior of its congeners. I’ll keep commentary to a minimum and post some examples from our area (the seven photos immediately below) and then links to work done by other Campephilus woodpeckers. Pale-billed (on palm):There’s no scaling here, but the exit tunnels have been expanded vertically, and the expansions resemble some of the rectangular ones above. Pale-billed (at nest): Very targeted digging and slight expansion of some exit tunnels. Pale-billed: On a scaled surface, some tunnels expanded. Robust: I’m including this almost as much for how well it shows Campephilus foot structure and the rotation of the fourth toe and hallux. Cream-backed: Somewhat more aggressive expansion of tunnels on longer dead wood. Red-necked: Targeted digging to the right of the bird. Crimson-crested: Elongated dig into exit tunnel. Crimson-crested: another great shot of the Campephilus foot. Targeted dig at bottom of scaled area. Crimson-crested: Video showing targeted digging on an unscaled area. Magellanic: are the most Dryocopus-like in the genus in terms of foraging behavior. Note their smaller bills and relatively shorter necks. They seem to spend a lot more time feeding near the ground and excavating large foraging pits than the other species, but they too do a considerable amount of targeted digging. Magellanic: The appearance of the scaling here is strikingly similar to what we think is diagnostic for ivorybill. The tunnel at bottom right has been expanded, likely with the tip of the bill. It looks as though there is more targeted digging above and to the left. The two images below, showing targeted excavations on small limbs, associated with extensive scaling on young, freshly ambrosia beetle-killed sweet gums, bear a striking similarity to work by Crimson-crested (the long furrows in particular) and Magellanic Woodpeckers. One final and more speculative observation that might be of interest to other searchers. I had dismissed this work on a live maple as likely pileated because it is generalized digging, not scaling. After going through so many images of Campephilus foraging sign, I’m a little more intrigued by it, as I see similarities to sign like this and this. Like some of the work on ambrosia beetle-killed sweet gums, this almost looks like a hatchet had been taken to the tree; the wood was not at all punky; and red maple at 950 on the Janka hardness scale, while not nearly as hard as bitternut hickory (1500), is harder than sweet gum (850). While I’m not proposing this as a diagnostic, it may be more interesting than I initially thought.